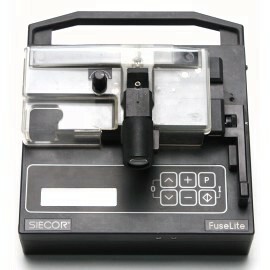 The FuseLite® Termination System, terminates optical fibers by fusion splicing to a prestubbed, factory-polished connector. This innovative combination of connector and fusion splicing technology provides a fast, user-friendly solution for high-performance optical fiber termination. The FuseLite Connector is a “near-zero-length” pigtail allowing field installation by fusion splicing to the field fiber within the physical boundaries of the connector. The stub fiber installed in the FuseLite Connector is polished in the factory, which eliminates the need for field polishing, increases the quality of the termination, and greatly reduces connector installation time. Single-mode connector options are FC, ST® Compatible, and SC, as well as angled FC and angled SC.